It was lucky for Southwest One that it misplaced the majority of invoices sent by its parent, IBM, when it published its erroneous 2010 accounts in January. It was already facing bankruptcy and Somerset County Council, its lead outsource partner, was trying to cut its contract. The missing invoices would have increased its losses 25 per cent to over £40m. It might have been the end of SW1. It was lucky for IBM as well. As 75 per cent owner, IBM’s reputation as an outsource service provider was riding on this, its flagship local government venture. With central government spending drying up and the coalition government pushing the privatisation of municipal offices, market research firm Kable has predicted that local government outsourcing will be the main source of growth for the public sector IT industry in the UK. This was no minor incident. You don’t lose £10m of invoices, amounting to 73 per cent of your run rate cost of goods and services from your parent, down the back of the sofa. SW1 was past the worse of its troubles when it found the invoices six months later and restated its 2010 accounts. But it would still have trouble explaining why Somerset CC didn’t know about the £10m additional losses when it renegotiated its contract. Here, SW1 and IBM had luck on their side again. SW1 was able to bury the additional IBM costs in the notes of its accounts by offsetting them – by cancelling them out. But this was not normal. You can’t just offset your losses against thin air and pretend they don’t exist. So how did SW1 bury the IBM invoices? It was like a card trick: it pulled something from its sleeve. That was a £9.512m credit note from IBM. By presenting the credit note in the notes of its 2010 accounts, it cancelled out the rediscovered invoices. Hence they could stay in the notes of the accounts. And the front page of the restated numbers – the headline costs and losses – could meanwhile remain unchanged. Anyone who looked at the accounts would be told, ‘Nothing to see here – carry on!’. But the £9.512m was curious. IBM did not give SW1 a credit note for £10m to cover the cost of the rediscovered invoices – although even that would have looked dodgy, or erroneous. It gave SW1 a credit note for the cost of the £10m invoices after they were balanced against a variety of other minor credits and deficits in its restated cost account that had nothing to do with IBM. This was just enough, in other words, to bury the loss. With the loss buried, the news that broke about SW1’s accounts in August was that its finances were better than they used to be. But they were in fact worse than it was letting on. Of course, this could all have been a succession of terrible but wholly innocent mistakes. They have indeed thus far proved so embarrassing that SW1 has refused to talk about them. There might have been a legitimate reason why SW1 lost £10m of invoices from its parent. SW1 and IBM finance executives might also have thought they had a plausible explanation for IBM’s fees being 73 per cent lower in 2010 when they signed the accounts off in January. They would presumably have demanded an explanation if they didn’t already know where this £10m had gone. They would presumably have tried to tally the invoices in IBM’s own financial records with the purchase orders in SW1’s. Such things are presumably done automatically by computer between IBM and its subsidiaries. A management accountant would presumably press a button to produce such a report. They would have presumably have done at least that much to verify that a drastic fall in IBM costs was help from Heaven and not some horrible mistake. IBM would presumably make efforts to account for £10m of invoices to one of its subsidiaries, no matter how trifling the figure is on its own $26bn accounts. Count the pennies and the pounds will look after themselves. Similar conjectures might be made reasonably of the £9.512m IBM credit note SW1 attributed to the period that ended 31 December 2010 – that it attributed not when it filed its accounts in January but when it restated them six months later. It is not as though SW1 didn’t have enough time to get the accounts right. It filed them four months late. And it has set itself up as a backoffice for local government, whose accounting is more efficient because it is automated. There was one more lucky break for SW1 in January. If it hadn’t filed its accounts so late it wouldn’t have first secured a £10m mortgage from IBM – which it did two days before the filing on 17 January. 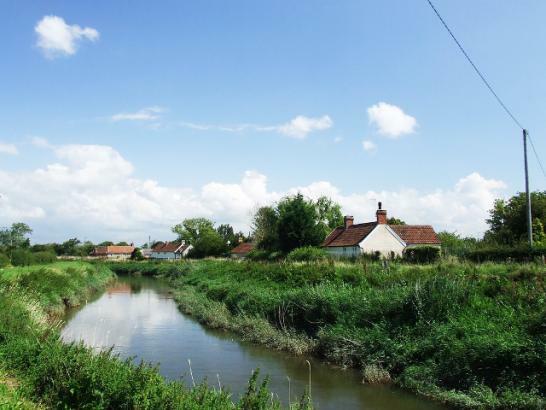 Though it couldn’t officially use this to credit its 2010 accounts, it did allow Derek Pretty, SW1 chairman, to claim the venture was a going concern when he signed off them off and went into the final stage of contract negotiations with Somerset CC. Southwest One published its 2010 accounts in January 2012. It reported 2010 payments to IBM, its parent, were down 73 per cent. Such a drastic fall in the single largest item in its cost account was relief at a time when SW1 was in crisis. 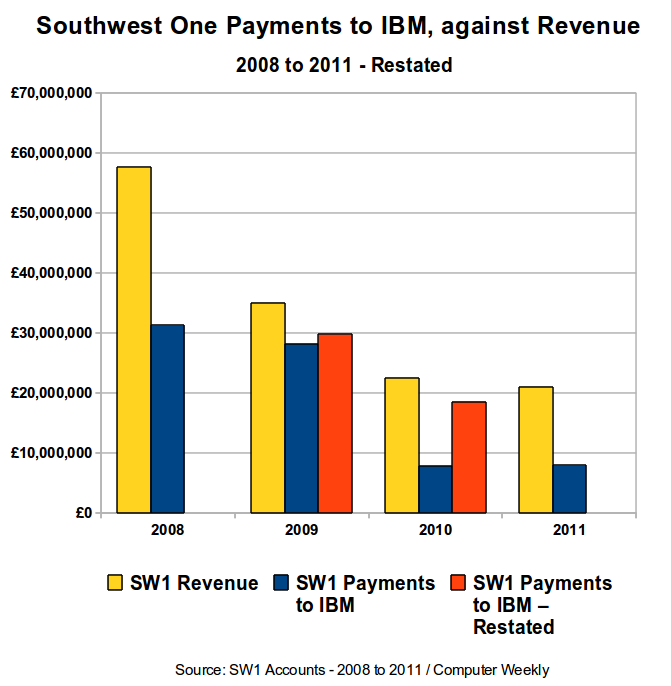 Finance staff passed SW1’s 2010 accounts without apparently clarifying the drastic fall in payments to IBM over 2009. SW1 restated its 2010 accounts six months later. It’s payments to IBM had not been so low after all. They had in fact been over 80 per cent of revenue. 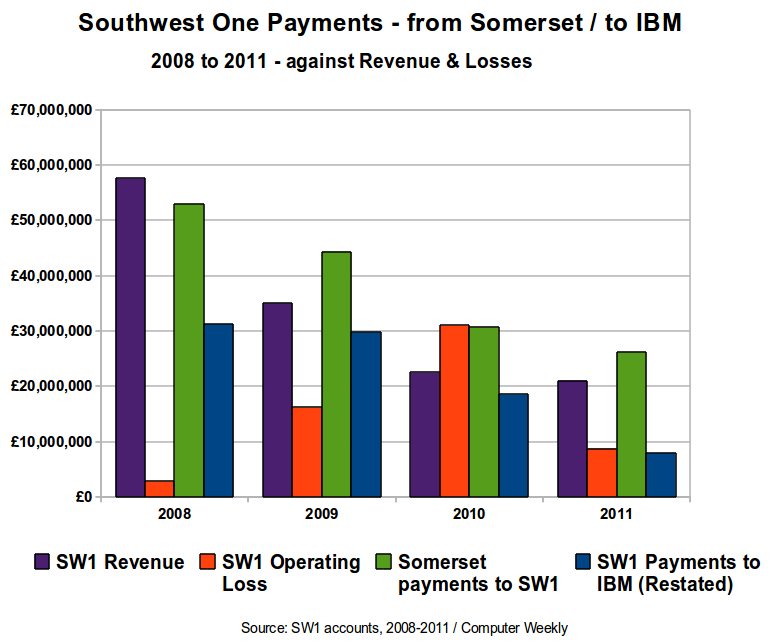 But SW1 had suffered a drastic cut in payments from Somerset Council. Somerset had been SW1’s biggest outsource partner. But it cut payments in half after Conservatives took power in 2009. Of SW1’s other outsource partners: one cut only 19%; the other actually increased payments by 70%. But SW1’s IBM costs were put in stark relief.